Former Judas Priest guitarist KK Downing will publish his memoir, “Heavy Duty: Days And Nights In Judas Priest”, via Da Capo Press on September 18. Co-written with Mark Eglinton, the project explores Downing’s history with the British metal icons, who he joined in 1969 and was featured on all of the band's releases from their 1974 debut, “Rocka Rolla”, to 2009’s “A Touch of Evil: Live” before his retirement from the lineup in 2011. “As the band approaches its golden anniversary, fans will at last be able to delve backstage into the decades of shocking, hilarious, and haunting stories that surround the heavy metal institution,” reads the memoir’s synopsis. “In Heavy Duty, guitarist K.K. Downing discusses the complex personality conflicts, the business screw-ups, the acrimonious relationship with fellow heavy metal band Iron Maiden, as well as how Judas Priest found itself at the epicenter of a storm of parental outrage that targeted heavy metal in the ’80s." 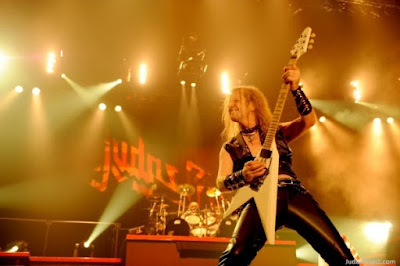 Although Downing was replaced by guitarist Richie Faulkner in 2011, he remains active in the band’s career as a member of the group’s board of directors. The set was recorded last year with producers Tom Allom and Andy Sneap.